Explore the creative communities of Cos Cob, Old Lyme and Mystic, Connecticut in the early 20th Century. These communities became an inspiration for artists and art students, among them Childe Hassam, J. Alden Weir, and Mystic Museum of Art founder, Charles Davis. Florence Griswold Museum Curator Amy Kurtz Lansing will share with us the importance of place for artists in these colonies, and how landscape inspired the impressionist movement in New England. 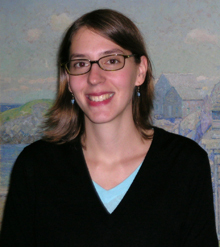 Amy Kurtz Lansing has been Curator at the Florence Griswold Museum in Old Lyme, Connecticut, since 2006. A graduate of Smith College, Kurtz Lansing received an M.A. and M.Phil. in the History of Art from Yale University. She has organized or co-organized an array of exhibitions, including Call of the Coast: Art Colonies of New England; Stickwork: Patrick Dougherty’s The Rambles; Visions of Mood: Henry C. White Pastels; and Historical Fictions: Edward Lamson Henry’s Paintings of Past and Present, which appeared at the Yale University Art Gallery and at the New-York Historical Society. Before coming to the Florence Griswold Museum, Kurtz Lansing worked in the Department of American Paintings and Sculpture at the Yale University Art Gallery.